A version of this magnificent blade is housed in the Royal Armories in Leeds. The countless clans throughout the highlands used swords of this caliber. 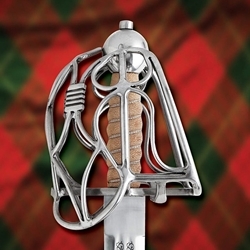 Our version of the Late Scottish broadsword has an intricate wire basket-hilt forming a heavy, protective guard. The grip is covered in natural ray skin for an excellent grip and then beautifully wire-wrapped. The high carbon steel blade has double fullers which have been lavishly etched with an intricate pattern. The sword comes with a matching black leather scabbard which has had its metal throat and tip decorated with matching engraving. Can be sharpened for additional fee. Edge: Unsharpened Weight: 4 lbs. 6 oz.